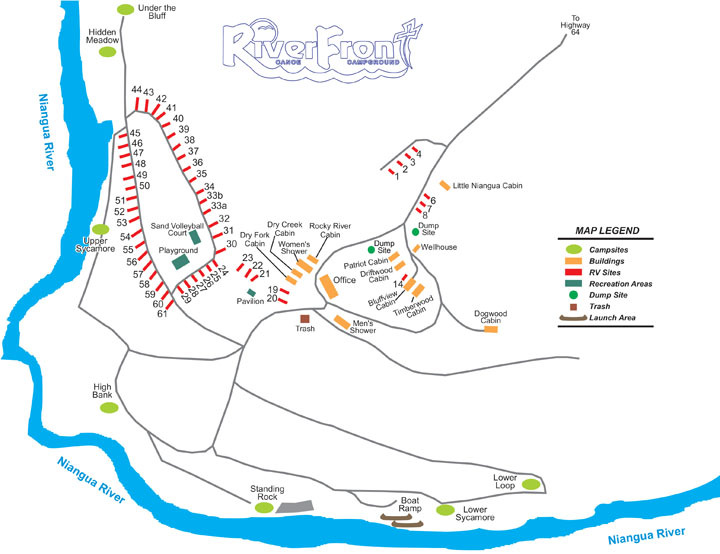 If you enjoy camping, you’ll really have a great time at Riverfront. There’s obviously a reason for our name…the primitive campsites, along with full hook-ups for RVs, are stretched alongside one entire mile of Niangua river frontage. There’s simply nothing like falling asleep with the soothing night sounds of the forest and the swish of a flowing river. With the wide selection of campsites available, you will have no problem finding one that’s perfect for a small family or large group. If you get tired of beans and marshmallows, Riverfront offers a comprehensive catering service for breakfast, lunch or dinner. We can accommodate up to 30 people and meal variety ranges anywhere from hamburgers to Kansas City Strips. (Final guest count is required ONE WEEK prior to the event. Also, a ONE WEEK NOTICE is required for cancellation. If you’re not in the mood for camping please visit our RENTAL CABINS website to arrange clean and comfortable lodging for your next visit. Quiet Hours begin at 11pm each evening. ALL MUSIC MUST BE TURNED OFF THEN! Security guards on duty Friday through Sunday. Dogs must be on a leash at all times and cleaned up after. Sorry, no ATV’s, firearms or fireworks permitted. Please do not deface or mar any trees. Please no cans in the firepits. Picnic tables on a first come, first served basis. Serious cooks please bring your own grill. Firewood for sale, or you may gather drift or fallen wood. The main shower house is open 24 hours a day. Staff persons are available 24 hours a day. Check out time is 12:00 noon unless you are on a float trip. Riverfront Campground and Canoe Rental is open from the end of February through October 31 each season. (Additional people must pay regular camp fee) We MUST receive two weeks notice for cancellations on electric sites.